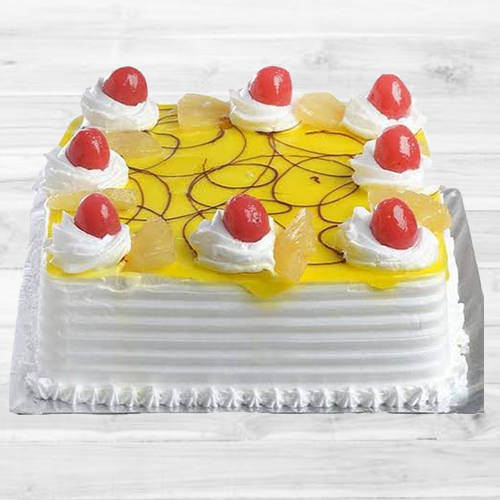 Share this Fascinating 1 Kg Eggless Pineapple Cake with your loved ones and make every moment of the celebration just incredible. Give an unmatched to your loved ones by ordering for them, this Fluffy 1 Kg Eggless Vanilla Cake. No one say No to have a 2nd piece of this Devilishly Tasty 2.2 Lbs Eggless Strawberry Cake. Express your heartfelt love to your dear ones by gifting them, this Exceptional 1 Kg Eggless Black Forest Cake. See tears of happiness in the eyes of your dear ones when you send them this gift of Refreshing 12 Red Roses with 1 Kg Eggless Pineapple Cake wrapped up in your love. Make your birthday, anniversary or any other event more memorable with this Mouth-Watering 2.2 Lbs Eggless Plum Cake from Taj / 5 Star Bakery.